People are constantly bombarded with images of a “perfect” body. You’ve no doubt been told to avoid the messages sent to you about what a body should be or should look like, but it can never be said enough! The truth of the matter is that you don’t need to be as thin as a supermodel to be healthy. In fact, being that thin for many people is the opposite of healthy. It’s not about having a perfect body, but about finding what is perfect for your own body. Here are some of the factors you can use to judge just how perfect your body is for you and how to understand the bigger picture of your overall health, regardless of the size of your pants. Weight is really not a great way to gauge your individual health. In fact, the number on the scale can be misleading. There are so many factors that can impact your weight – salt intake, dehydration, the scale you’re using – that you need to learn not to let the scale impact your efforts to work toward and maintain better health. The arbitrary number on your scale says nothing about your mental health, your physical fitness, your risk of disease, or other aspects of wellness that are important to your overall health. The real problem with some people’s obsession with weight is how it makes them view their bodies. You simply cannot tie weight to health and avoid shame associated with the scale. Hyperfocus on numbers makes thinner people less concerned about their health (when they shouldn’t) and heavier people feeling as if they’re failing in some way (also when they shouldn’t). Let’s try to forget about the scale and discuss what you should truly focus on if you seek to be healthier. Diet is probably one of the most important factors of individual health because the old adage is true: You are what you eat! A person who eats McDonald’s every day isn’t going to be as healthy as someone who eats fresh fruit, vegetables, and whole grains each day, no matter their weight – it doesn’t take a genius to figure that out. Pay attention to what you eat, making sure to avoid processed foods and getting enough of each food group every single day. Don’t fall victim to fad diets that cut out a major food group, either. Remember, your body needs carbohydrates to function, so choosing quality, complex carbohydrates is essential to good health and function. Try not to view eating as an all-or-nothing approach. Eating salads all day every day is no guarantee of good health (have you looked at the fat, sugar, and calorie content of salad dressings lately?). Eat when you’re hungry, stop eating when you’re full and don’t beat yourself up when you have a treat. You’re human, after all, and chocolate is the nectar of the Gods and in some cases (such as with dark chocolate) is actually good for you! Effortlessly touch your toes – Seems simple, right? If you’re flexible and your muscles are loose, then this should be no problem. Sleep well – If you’re getting enough physical activity in your day, then your quality of sleep should be good and falling to sleep at night a breeze. 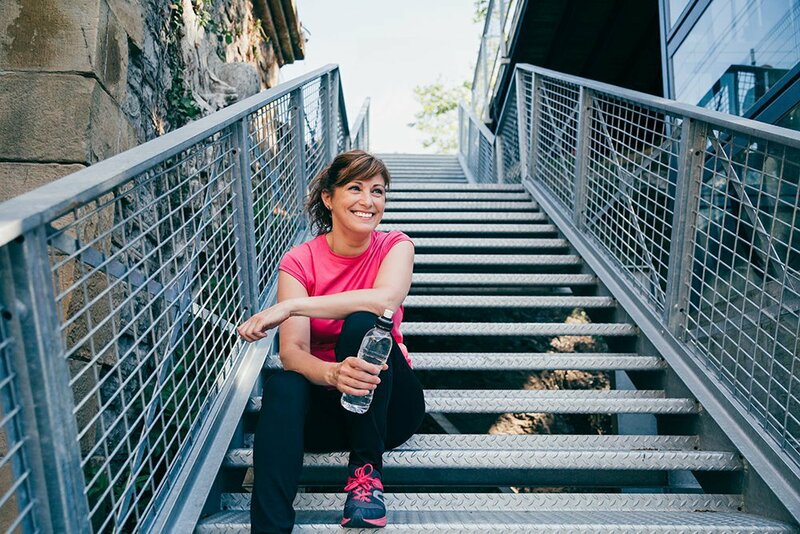 Climb stairs – Most everyone gets a little winded when climbing a flight of stairs, but if you feel as if your lungs are going to explode or your legs are going to give out after doing it, then you may not be in as healthy as you think you are. Do push-ups – Muscular endurance is a great indicator of health, so completing push-ups with proper form is a great indication of how good your upper body strength and endurance are. To be healthy you must be active, there’s no way around it. Make sure to work even just a little movement, such as an after-dinner walk, into your daily routine. It will make a big difference in your overall health and help you to feel better about your body too! Sleep has already been briefly touched upon, but it’s so important that it deserves a second mention! The activities of daily life take a toll on the body and it uses sleep to help revitalize and rebuild. Erratic sleep patterns can impact concentration, weaken your immune system, and cause you to overeat. Adults should get between seven and nine hours of uninterrupted sleep each night, according to the National Sleep Foundation. You should also strive to create a bedtime routine for yourself where you go to bed and wake up at roughly the same time each day (including weekends!) and turn off electronic devices at least one hour before bed. Try to relax before you tuck yourself in for the night and you may find you have an easier time falling asleep. Let’s not forget that a major component of health is happiness. You could have the best job in the world, an exercise routine that excites you, an eating routine that’s tasty, and feel refreshed when you wake up each morning, but if you’re not happy, then what’s the point? When you’re happy, a healthy lifestyle will come easily. You’ll also find you’re healthier, as happiness boosts your immune system to help you fight off illness and your digestion is on point — all because you’re happy. Happy people are less likely to suffer from insomnia and better sleep helps you to be a better frame of mind to face the day’s challenges. Find what gives you joy and go after it – reasonably, of course. Losing all your money at the casino probably isn’t a long-term recipe for happiness and health, even if you have some fun while doing it. When you go to the doctor and face the scale, chances are you’re given a number based on your weight and height called your body mass index or BMI. The BMI is how obesity is diagnosed in the medical community, but people are starting to understand the flaws of the BMI more each day. For starters, the BMI is too narrow. It takes only two factors into account – height and weight. This tool can be great for tracking weight trends in large populations, but when applied to individual people it begins to fail. Case in point: Olympic athletes often have obese BMIs due to the amount of muscle they have on their frames because muscle weighs more than fat. Does that sound like an accurate assessment of a person who is in such good shape, they’re an Olympian? You shouldn’t let your BMI number serve as the only indicator of your health. The BMI is limited, as it only looks at one small slice of the overall health pie (mmm…pie) of an individual. Don’t let it shape how you feel about your health and wellness or how you feel about your own body. It’s important to make peace with your body. You may look at others and be envious of different aspects of their looks, but don’t let that impact how you feel about yourself. Focus on your health and maintaining a healthy, livable body. That’s the secret to success, happiness, and peace!